MMS 8th GRADE/COMMUNITY BAND CONCERT: The 8th Grade Wind Ensemble and Honors Wind Ensemble will be performing as part of a joint concert with the Maplewood Community Band this Wednesday, March 29th at 7:30pm in the MMS auditorium. All info can be found in the flyer HERE. Please click HERE to donate baked goods for the Bake Sale Fundraiser. All proceeds from the sale will be split between the Community Band and the MMS Music Department. 8th GRADE TRIP TO SEE HIDDEN FIGURES: The 8th graders are seeing Hidden Figures on Friday, March 31st. Permission slips and money will be collected Monday & Tuesday of this week during their lunch period. Click HERE for the permission slip. 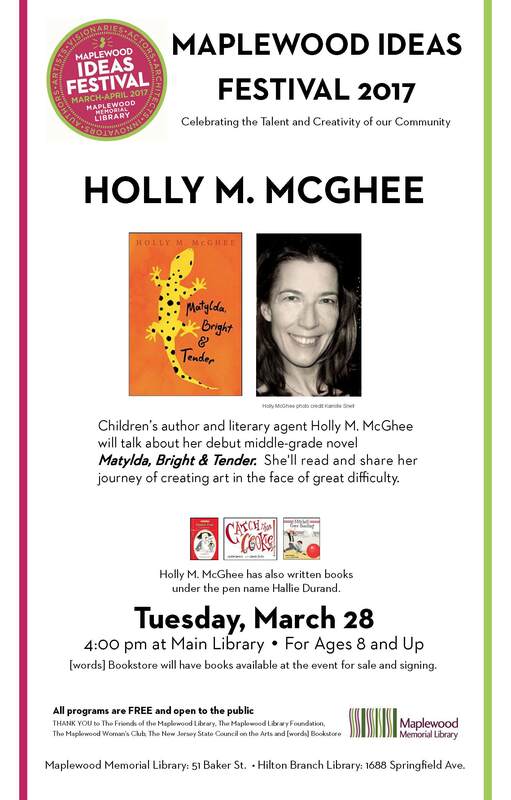 AUTHOR VISIT AT MAPLEWOOD IDEAS FESTIVAL: On Tuesday, March 28th at 4pm in the Maplewood Main Library, MMS parent, children’s author, and literary agent Holly McGhee will talk about her debut middle grade novel, Matylda, Bright & Tender. Please encourage your students to attend and listen to she reads from her book and shares her journey of creating art in the face of great difficulty. All info can be found HERE. SPRING YOUTHNET ENROLLMENT IS OPEN: YouthNet classes start next week, Monday, April 3rd. Don’t forget to enroll your students! Click HEREfor all the info and a description of the great course offerings. WOMEN’S HISTORY MONTH COMMERCIAL CONTEST: The deadline for the Women’s History Month Commercial Contest is this Friday, March 31st. Click HERE to check out the info. Can’t wait to view the entries! MARCH ART CONTEST: The March Art Contest deadline is also this Friday, March 31st. Click HERE for all of the info and requirements. So much talent at our school, looking forward to seeing what the students create! MATH COURSE SELECTION FORMS: 6th & 7th grade parents -- your students’ math course selection forms for next year are due back on Friday, March 31. If you have any questions about the levels or the process click HEREfor all of the middle school math documents or contact your student’s current math teacher. MMS YEARBOOK: The deadline to order the MMS Yearbook is May 13th. The flyer outlining how to order online or in school can be found HERE. And information on purchasing a “Well Wisher” for an 8th grade student to include in the yearbook can be found HERE -- deadline for Well Wishers is April 1st. Have questions? Please contact Ms. Hansen (mhansen@somsd.k12.nj.us) or Ms. Varney (rvarney@somsd.k12.nj.us). YOUTH IN ACTION NIGHT: Mrs. Felder’s Youth Net club, Students for Social Change, has been working all year on their research project to showcase at Rutgers in May. Please join them for a showcase of all of their hard work on social justice issues on Wednesday, April 5th from 4pm-6pm in the SOMS auditorium. All info can be found in the flyer HERE. Let’s support these amazing kids as they explore issues of racial justice, environmental justice, gender equality, improving the effectiveness of schools, and LGBTQ+ rights! SCHOOL STORE: Our recent efforts to bolster the MMS School Store have been working thanks entirely to the incredible generosity of you, our parent community! Please keep it up! The School Store Wish List is HERE. Or donate funds via Pay Pal. Or drop off items you purchase in the Main Office. Please contact Ms. O’Sullivan at mosulliv@somsd.k12.nj.us to coordinate any deliveries or to ask questions. Thank you! TALKING TO YOUR CHILDREN ABOUT RACE: Please see the attached flyer HERE and read about the important seminars hosted over the next few weeks by The South Orange/Maplewood Community Coalition on Race. So important and relevant today, renowned professor Diane Hughes, whose focus is on bias and race, will help parents and educators navigate talking to children about race. YOUTHNET BINGO: YouthNet is holding a multigenerational Bingo fundraising event at Dehart Senior Center on Sunday March 26th from 2pm-4pm. All ages welcome! All info HERE. STRENGTHENING FAMILIES OF ESSEX: Strengthening Families of Essex (SFOE) is a free 14 session family skills program to help children succeed and families build stronger bonds.The program started yesterday, Saturday March 25th, but you may join mid-way. It meets each Saturday for 7 weeks from 10am-1pm at 170 Scotland Road Orange NJ 07050. Click HERE for all of the info about this great opportunity. Ok everyone! That’s it for now. See you in April!